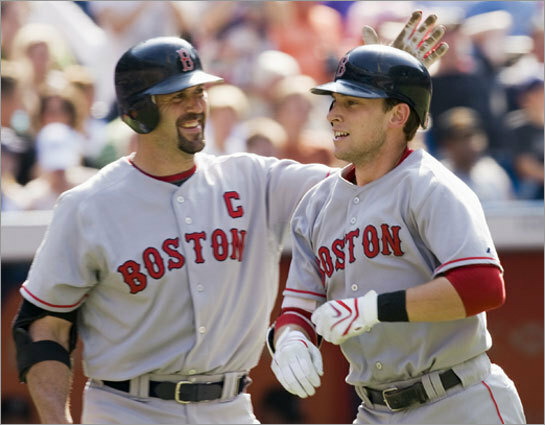 (AP) The captain and the kid: Jason Varitek salutes rookie Jed Lowrie for his 11th-inning homer, the first game-winner of his career. TORONTO - There might have been a collective sigh of relief from the Red Sox, but there was hardly any time. With their bus to the airport leaving scarcely 40 minutes after Manny Delcarmen got Jose Bautista swinging to end the 11th inning and the game, there seemed to be more of a chance for someone - Jacoby Ellsbury was a good candidate - to get left behind than to celebrate. Still, there was an acknowledgement that, for all the bad that had occurred on this road trip, yesterday's game was good, was important, and might even have been crucial. Even with a team that is bloodied (Ellsbury) and hurting (just about everyone else), beating the Blue Jays to win their second straight series on the road could just be the momentum needed. Especially heading into New York, where a Yankees team that is all but out of it would be happy to play spoiler. "It seemed important," manager Terry Francona said. "I'm not downplaying the importance of it. Any time you have a day off, you're going to handle your pitching a little bit different anyway, but we've gotten to a point in the season where every game is important. "We've come out of this place with some tough losses. I don't think we would have quit or hung our heads, that doesn't worry me. But it was a great win." And a great effort. Despite a mediocre start from Daisuke Matsuzaka - at least he walked only one batter - the Red Sox put together a series of highlight-reel moments to formulate a 6-5 win over Toronto in front of 44,521 at Rogers Centre. It was a win, too, that brought the Sox one game closer to the Rays, who lost in the 10th inning to the White Sox. There was Ellsbury, bloodying himself after smashing into the right-field wall making a catch in the fourth inning. There was Jason Bay, leaping to make a two-out 10th-inning grab that could have been trouble, had it bounced high off the wall as it seemed destined to do. There was Jed Lowrie, smashing just the second home run of his career, and his first game-winner, in the 11th. That final blow to the Blue Jays left just the bottom of the 11th for Manny Delcarmen. And the replays for ESPN. "I think it's huge," Bay said. "A few of us were talking, it's probably a lot bigger than just a regular-season win. Given the way these guys are playing, they're trying to catch up to us, and they've got the pitching to do it. Those guys right now, they're hitting. To get down early the way [A.J.] Burnett's been pitching, it could have been a long day. But Pedey comes out, boom." That "boom" was Dustin Pedroia's three-run homer to left in the third. After Matsuzaka gave up a two-run blast to Vernon Wells in the first inning, the second straight day Wells hit a two-run blast in the first, the Sox could have been in trouble. Burnett, after all, had won six consecutive starts with a 3.35 ERA. But Burnett walked Alex Cora and Coco Crisp with one out in the third, then Pedroia slammed his three-run shot to left. That was followed by David Ortiz's double, breaking an 0-for-11 skid, and a run-scoring single by Kevin Youkilis. But even when Matsuzaka gave back the lead, Coco Crisp's solo homer in the seventh brought the Sox back, tying the game at 5. And that was where it stayed, as it headed into extra innings, until Lowrie lofted his first career lefthanded homer out to right field off a slider from Brandon League. "He continues to impact the game," Francona said of Lowrie. "We'll take it. We need it." There is no question about that, because these have become somewhat desperate times for the Red Sox. With injuries up and down their lineup, Ellsbury stayed in the game despite abrasions to his face and shoulder. Francona even went to Jonathan Papelbon with the score tied on the road in the ninth inning, something he is loath to do under more normal circumstances. But his bullpen is on its way to being fried, even with tomorrow's day off, and he needed his closer. Francona even said would have loved to send Papelbon out for a third inning, as he had only thrown 16 pitches, but ultimately opted against it. So there they were, contributions up and down the lineup, out of the bullpen, from everyone. It's about how the Red Sox would love to win games down the stretch, especially as injury concerns have built up. So, as happy as Lowrie was to homer in extra innings, it was the win as a whole that got top billing. This is the time for such things with just 32 games left in the season, and the Sox still down 4 1/2 games to the Rays in the American League East and up just one in the wild card. "It's obviously a big thrill, especially this time of the year, 'cause every win counts for so much," Lowrie said. "It's one win, but every one counts so much more right now. "Ellsbury looked like he just got done with a 15-round fight, Bay made a leaping catch off the wall. I think we set a good tone today with this win, and hopefully we can carry that over through New York." That's the plan at least. But there was more to yesterday's game than just business. Or, as Francona said, "That was one of the funnest games I've been a part of in a long time."